Clear Liver Heat, reduce Internal Wind, decrease high blood pressure, soften hardened arteries, yet also strengthen them so they will not be easily torn or broken, decrease high cholesterol levels in the blood. 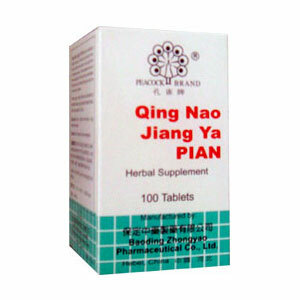 Baoding Zhongyao Pharmaceutical Co., Ltd.
Jiang Ya Pian aids in maintaining healthy circulation. This product also aids in maintaining healthy brain function, visual equilibrium, and sleeping patterns. Hypertension, especially in the early stage, with symptoms of dizziness, headache, tinnitus and excess anger.